(John 1:1-14). Everything that exists came into being at his command and is therefore subject to him, finding its purpose and meaning in him. The implication is that in every sphere that we engage in, be it Government, Media, Arts or education, and every topic we investigate, from ethics to economics to ecology, the truth is found only in relationship to God and His revelation though Jesus Christ. The entire cosmos can be understood only in relation to Jesus. The church’s singular failure in recent decades has been the failure to see Christianity as a life system, or worldview that governs every area of existence. By failing to see Christian truth in every aspect of life, we miss great depths of beauty and meaning: the thrill of seeing God’s splendor in the intricacies of nature hearing his voice in the performance of a great symphony or detecting his character in the harmony of a well-ordered community. Most of all, our failure to see Christianity as a comprehensive framework of truth has crippled our efforts to have a redemptive effect on the surrounding culture. 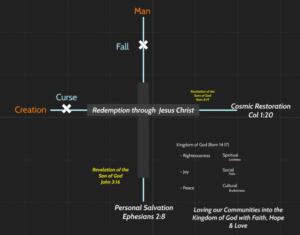 When Jesus paid the price for redemption, the full price for both personal salvation and cosmic restoration was established. The key to our personal salvation, we know, is in the revelation of God’s love revealed through His Son. The key to the restoration of creation is in us as the redeemed children of God, now co-laboring with Christ to affect the transformation. Jesus is the origin and end of all things, the Alpha and the Omega. Nothing has meaning apart from him. Nothing exists apart from him. He is the agent of creation, author of all that is and ever will be. Who is the image of the invisible God, the firstborn of every creature: For by him were all things created, that are in heaven, and that are in earth, visible and invisible, whether they be thrones, or dominions, or principalities, or powers: all things were created by him, …..
and for him: and by Him to reconcile all things to Himself, by Him, whether things on earth or things in heaven, having made peace through the blood of His cross. In the first chapter of John, Christ is called the logos. In the Greek, logos literally means the idea, the word, the rational pattern of creation, the order of the universe. John 1:1-3 In the beginning was the Word, and the Word was with God, and the Word was God. He was with God in the beginning. Through Him all things were made; without Him nothing was made that has been made. Unfortunately, most Christians don’t always function from a biblical worldview of Christ being Lord of all spheres of life and society, but only a cursory knowledge of pet Bible verses they recite for physical and emotional health, and eternal security. This limited, fragmented knowledge of Scripture has resulted in believers acquiescing to secular humanistic views in all practical matters dealing with the stewardship of the earth. This leaves the church relegated to dealing only with matters of religion and so called spirituality. Consequently, although we have an abundance of Christians serving in secular society and numbers of people attending Sunday church services our culture continues to reflect a humanistic worldview which brings us to the next step. We need more Christian thinking, not just more Christians in societal leadership We have an abundance of Christians serving in government, public schools, universities, hospitals, politics, businesses, and other spheres of society. With so many Christians already placed in influential positions, we need to recognize that the major challenge we face in regards to experiencing a biblical reformation is not a lack of the presence of Christians but a lack of Christian influence, or Christian thinking in all these prominent. This is the incarnation principle. If they don’t see us they cannot Be us. We need to immerse ourselves into our culture. In the world but not of the world! The following are twelve immersion principles to transform a secular society, and based on the life of Daniel. Note that we have no record of Daniel ever preaching against a king or preaching against witchcraft. Principles to influence a secular society. God allowed the Jews with potential who had prepared themselves to be chosen and set apart (Daniel 1:4). Notice their qualifications: Good appearance, showing intelligence in every branch of wisdom, endowed with wisdom and understanding, and the ability to serve in the king’s court as his advisors, the highest political positions. Daniel and his friends were trained in higher education to be placed as the heads of societal positions. They had a Biblical foundation, thus a biblical worldview with secular application. (Daniel 1:5). Daniel and his friends were trained in all the literature and language of the Chaldeans (Daniel 1:4). Effective biblical worldview thinking means knowing and understanding popular and contemporary literature so the Bible can be applied skillfully to it. Daniel and his friends were trained to speak the language of Babylon. Daniel allowed himself to be renamed (Daniel 1:7). They fully identified themselves to their surrounding culture, without any sense of compromise. Paul said that his method of soul winning included becoming all things to all people that he may win some (1 Corinthians 9). Daniel didn’t compromise his faith or his internal identity (Daniel 1:8). Daniel purposed in his heart his commitment to what he knew was right, and engaged the secular with grace! When Jesus became a human He lived in such a way, making himself attractive even to sinners, without ever compromising His divinity and holiness. Daniel and his friends trusted God to grant favor and lift them up every step of the way in their journey into prominent positions of influence (Daniel 1:9). We live from a sense of calling and destiny, and live within divine favor that translates into moments of tangible blessing. God loved the Babylonians so much he allowed His people to be taken captive and live in their land so that His word could transform this empire.